What Lies Beneath Rattlechain Lagoon? | For the victims of Industrial Pollution What Lies Beneath Rattlechain Lagoon? Rattlechain Lagoon (or mere) is a chemical Hazardous waste lagoon located in Tividale, Oldbury,Sandwell West Midlands near Birmingham. Public concern about what was being tipped there appears as early as 1957. What “lies” beneath the water is a long story of denials, deceptions and a stain on the local area. Rattlechain lagoon is a few hundred metres from Tipton Road (A457). It is surrounded by two legs of the Birmingham Canal, the Dudley Canal, and the Gower Branch Canal. It is a scant 60m from one arm of the Birmingham Canal. The River Tame runs past, about 150m away. Newtown Primary School is 500m away. The industrial units located nearby are giving way to new housing estates. The garden fences of some houses on Callaghan and Wilson Drives are within 20m of the lagoon. Rattlechain lagoon is located in the middle of a heavily populated town . It is within the Sandwell Metropolitan Borough near Birmingham. The actual location is off Johns Lane in Tividale, Oldbury, West Midlands, National Grid reference S0 974 913. It also together with the chemical factory at large that supplied it within the parliamentary constituency of WEST BROMWICH WEST. The area is recognised as one of the most deprived in the country, and this has been linked to polluted areas in Britain. The site is visited by birds and waterfowl, including swans, geese and ducks. 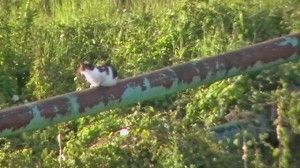 Foxes and domestic cats visit the site. Rattlechain Lagoon is known to contain several tonnes of white phosphorus, as well as other highly toxic chemicals. We will attempt to tell its long story, (warts and all) , and record the changes that have and will take place on the site in the coming years. Look at the map. Zoom out and see where it is. I find the information about the Rattlechain Lagoon very concerning. Why has these issues not been brought to the public’s attention before? What secrets do other local beauty spots hold? What will local people and wildlife suffer in the future following the consequences of such disgusting coverups from the past? Yes you’ll certainly “find it in Sandwell”. This one is just the tip of the iceberg, and some people like to publicise it’s “a borough to be proud of.” Unfortunately these type of things get buried like bad news John. The legacy of the Industrial Revolution (and what came afterwards) has left an impact on the Black Country (and parts of Birmingham) in general. 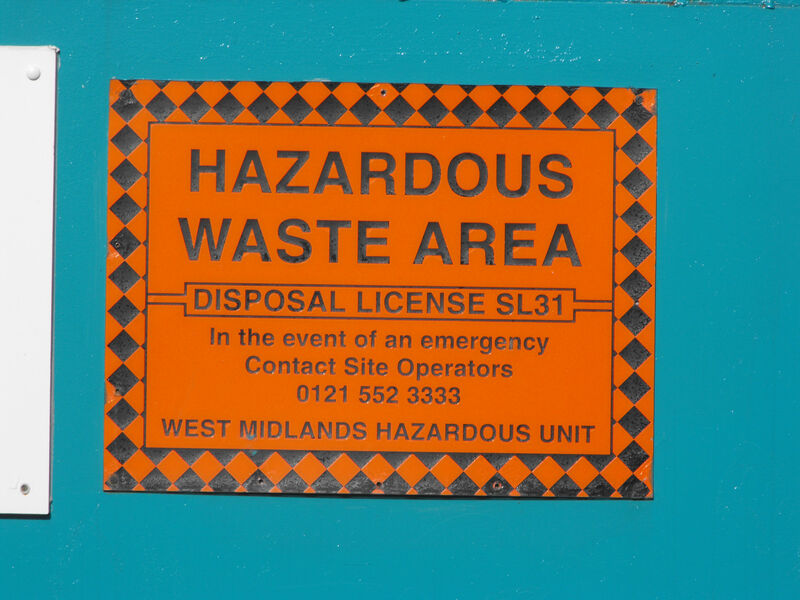 There will possibly other sites dotted around where there are toxins beneath the surface water or soil, depending on what the site is or what was manufactured there. In fact, this is probably almost certainly the case. I am so shocked to find this is in my local area! Very concerning! Fantastic website – it’s about time people get to know about this Lagoon – Well done! I am researching my paternal grandmothers family and was told that they worked for Sheldon Brickworks. Looking for information under the name of Sheldon gave no info or responses. Then fortunately I log in Tividale canal, and have turned up a wonderful cache of information, Sheldon name crops up in some reports but the owner is named as Samuel Barnett. I am still researching but would like to thank all the people who have made a contribution to make the “Lagoon” an issue. Who in their right mind would want to PURCHASE a home within wind distance of this toxic waste. Were all the buyers made aware of this before buying, are their funds in keeping for any health issues now and in the future? Any families with the name of Goode or Biggs in their tree, I would love to hear your response too. Can I just add, that I remember the sickly smell which used to drift across Greets Green, with the wind direction, from Robinsons Chemical Factory in West Bromwich. This was located at the top of Phoenix Street. I remember this smell in the late 70s/early 80s, as my Grandad lived in Atlas Grove and I sometimes was taken to play on the park swings etc in Farley park. It was awful. I can’t exactly remember when, but a few years later (I was working , so it was sometime after 1988), I remember Midlands Today picking up with several stories of residents living near the factory being sick and pets falling seriously ill. I think one person at least , was hospitalised. Does anyone else remember this? The perils of living in Sandwell, it seems. Or at least it did, then. Is this site undergoing evaluation and subsequent remediation? This site isn’t just being left alone to sit there, is it? Surely as a modern western civilization there are environmental laws that require site cleanup? I live in the US and I had to find out about FMC, Pocatello Idaho. Although I was disturbed to find the cleanup process ball had not even started rolling until 2012, at least it’s happening. It takes years. There are like 5 phases to cleaning and managing toxic waste appropriately. It won’t be until next year, 2019 that the toxic marsh is undergoing actual cleaning! Thank God for the Environmental Protection Agency! Our evil cheeto of a president has no clue of which he speaks when he says we need to get rid of the EPA. There’d be hell to pay for a president who challenges the agency! Now, if the US has such protections and actions, surely the UK does. Is this site going to be managed or not? You know, someone could just fall in and die. I can’t believe people live, work, and go to school within walking distance of such a place. There are automobiles parked right next to it! Leaving Rattlechain as-is would be a criminal act against humanity and the planet. How could a country with both a Queen AND a Parliament let such a travesty be? Thanks for your interest and information regards the FMC plant. Unfortunately the process in the UK is usually to bury it and forget it, and so long as there are no “pathways” , the environment agency and others believe it to be “safe”, even though the many lessons of history point otherwise, but by then the main actors will long have fled the scene. A fence , some sand over the top of the waste and attempting to solidify it is all that they have done. Phosphorus in water with high ph emits phosphine gas, which is what is clearly happening here. I’m aware from literature that at the FMC plant, this was also a factor, but probably at higher levels, though the nearest houses I believe were not right next door as is the case at Rattlechain. This area is unfortunately saturated in housing, and it is for this reason that the waste mass in the pit probably cannot ever be removed, without rehousing all those who live anywhere near to it. Perhaps big business/politics prefers it this way. We owe a great debt of thanks to US scientists who advised us about white phosphorus and its effects on the environment and birds. I used to work for Alfred Matty and Sons in the early 1970’s. My self and Tom Heritage used to work on the canal boats taking the phosphorous waste to the Rattle Chain tip. It was a very heavy sludge which had to be stirred so that it could be pumped out of the boats. If the water / phosphorous mix was wrong and you bumped the boats in the locks or brushed against a bridge the sludge would catch fire giving of blue flames. to give you an idea how much sludge is in the pool we used to deliver 8 boats a day for 5 days and 4 on Saturday. Each boat had 20 tons in them.